Going to ramble about the man who inspired this card, so you can just skip down to the card if you don’t want to read the following paragraph. For the first time, I think I was able to pull off a masculine card for my husband that totally incorporates my style…so now I can’t wait for Valentine’s Day (yep, already have his card done ladies *wink* and will grab it right back off of him after he opens it). He is a great man. Busy with work so I try to do the little things (yucky ironing and preparing the quick semi-good meal…those things that interrupt you when you’re really into creating something and suddenly have to stop). I see how much he is working lately and I just wanted to write my thoughts on how I’m feeling and how much I appreciate him. One thing I can say about him is that he handles stress so well…he is stronger than me and has way more patience. I love to watch the interaction between him and the kids. I’m the strict one, and he’s so layed back. My birthday is approaching very quickly and not one bit excited…why is that? It becomes less fun when you pass a certain number? I was joking around saying I wanted to go to California in February and attend CHA as my b-day gift. To my surprise, he said, “set it up and let’s go”. I responded with a, “Shut up! !” (but wanting to jump up and down). My strategy was to START BIG and suggest traveling, then say, “Well, how about all these Nestabilities”…it works ladies — start big and negotiate…lol. I think he justs needs to get away and what better place than CA right? But, I’m gonna pass, stay at home with the kiddos and save the traveling plans for the SU! Convention. I think this is the perfect card for my man. 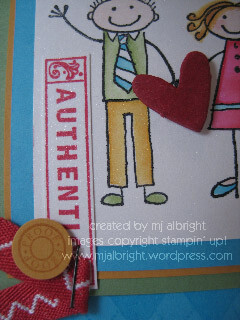 Stamp sets used: Classic Backgrounds, All In The Family, Stamp of Authenticity, and Define Your Life. Cardstock used: East Coast Prep DSP, Tempting Turquoise, Wild Wasabi, More Mustard, Real Red, and Shimmery White. Inks used: Stazon Jet Black, same as CS above. Real Red Craft, Versamark Pad. Accessories used: Fire Circle Rhinestone Brads, Jersey Ribbon Originals, Staples, Scallop Punch, Coluzzle Cutting System, 1/2″ and 1″ Circle Punches, Spiral Punch, Round Tab Punch. OH my goodness, that is so STINKIN’ cute, Mary Jo! OH man!! I was so pumped thinking you were coming to CHA! I totally understand about picking your plans…so, when are those Nestabiliites arriving at the Albright house? BAWAHH! I love your card! It is so fun and adorable, yet perfect for your man. Once again, you rocked it! That is a great card! I’m sure he will just love it! What a fun card! 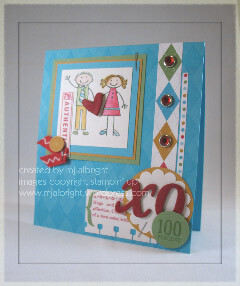 I love the happy colors and of course all the details you put in your card. Your sweet man sounds like a keeper! I think Mom’s are mostly the strict ones. Dad’s don’t want that role since they are away from the kids so much more then we are. So you are thinking of going to convention? I bet it’s awesome this year. I wish I could go and meet you! When is your big birthday coming up? You got to let us know. How *adorable* is that? I love hearing behind the scenes stuff. . . thanks for sharing! Go hug that man of yours! He’s a keeper! THIS IS PERFECT!! I have that set and haven’t inked it yet… you are so inspirational! What a good man you have there… we need to appreciate and love the good ones! Blessed indeed. 🙂 I’m sure he feels the same way about you babe! Have a super weekend MJ!!! Dang, MaryJo — I thought I might get to meet you next month! Oh well, Nestabilities are a close second, LOL! This card is adorable and great for a guy — wonderful job with the sketch! Mary Jo, you are too cute. I love your style and this card is amazing. I love this set, too, now just to use it more. great job with the sketch. Oh my, this is just the cutest! I love the *bling* and the diamond pattern you created along the side. You did a fantastic job on this card! Thanks for sharing.